For over a decade, I taught preschool all around the world. Which means that I have seen kids’ lunches from Seoul to Seattle. Not only that but I’ve experienced the universal struggle of getting children to sit at a table and eat food. Whether each meal is delightful or dreadful really depends on what’s on the menu and the company you share it with. Overall, though, I had more good lunches than bad ones. I also have to admit, having good food helped make those good days a success not only with kids but also with me. After all, it’s difficult to get a child to eat a meal that you wouldn’t eat (and they don’t have the option of sneaking out to the noodle shop down the road for a tasty snack during nap time). However, no matter where I found myself there was always one dish which, whenever it was served, I couldn’t resist extra helpings. 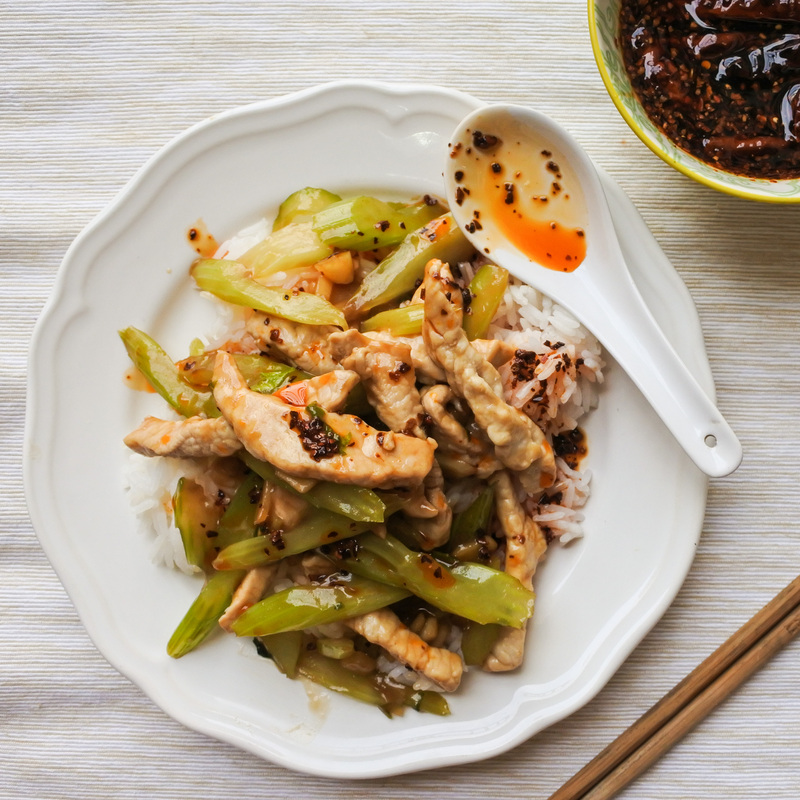 In China, that dish was pork and celery stir-fry. I just loved it. What is not to love about crisp celery paired with fatty pork in a sauce just salty enough to make your mouth water and served with rice? Nothing! It’s delicious! Now I make a more adult version of it at home with pork topside, a lot more ginger and garlic and a coating of Hoisin and soy sauce. It’s still a favorite with the kids but a bigger hit with the adults and is great to make if you are looking for a lighter, healthier meal that is also quick and easy. Feel free to do as I do, and eat this stir-fry in a big bowl with steamed rice and a big bottle of Tsingtao beer in front of the TV….because you’re an adult now so it’s OK.
Pork and crunchy celery stir fried together in a salty soy and Hoisin sauce. A healthy and delicious stir-fry favored by both kids and adults. Combine Hoisin sauce, soy sauce, rice vinegar, cornstarch and water into a small bowl. Mix well and set aside. Slice pork loin either into long strips or short chunks no bigger than 1 in / 2 cm. Put in a bowl and set aside. Clean celery and separate the ribs from the leaves. Chop into either long strips or short pieces no bigger than 1 in / 2cm. (Same size as pork) Place in a bowl and set aside. In a large wok, heat 2 tbsp oil on high heat. Add sliced ginger and garlic. Let cook for about 1 minute or until fragrant. Add celery, season with salt and pepper and cook for 2-3 minutes on high heat. Celery should be slightly cooked but still crisp. Add sauce mixture and stir until everything is evenly coated then turn off heat. Transfer to a plate and serve with steamed rice. Top with a drizzle of Chinese Chile Oil for those more inclined to spice. Combine Hoisin sauce, soy sauce, rice vinegar, cornstarch and water into a small bowl. Mix well and set aside. Slice pork loin either into long strips or short chunks no bigger than 1 in / 2 cm. Put in a bowl and set aside. Clean celery and separate the ribs from the leaves. Chop into either long strips or short pieces no bigger than 1 in / 2cm. (Same size as pork) Place in a bowl and set aside. This post was updated on April 26th, 2019.